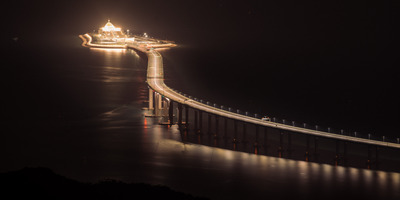 (Photo by Billy H.C. Kwok/Getty Images)An evening view of the Hong Kong-Zhuhai-Macau bridge and its entrances to the new cross-sea tunnel. Xi gave an abrupt two-second speech that caught observers by surprise. “I announce the Hong Kong-Zhuhai-Macau bridge is officially open,” Xi said Tuesday. After 10 years and 420,000 tons of steel, and at a devastating cost in lives and renminbi, the Hong Kong-Zhuhai-Macau bridge is officially open – and the announcement came by a strangely curt Chinese President Xi Jinping in the port city of Zhuhai. In an unexpected and breathtaking display of brevity, Xi declared the world’s longest sea crossing – a 35-mile (55-kilometre) bridge and underwater tunnel connecting Hong Kong, Macau, and the mainland Chinese port city of Zhuhai – as open with an abrupt two-second speech that, it is fair to say, was not what everyone was expecting. “I announce the Hong Kong-Zhuhai-Macau bridge is officially open,” Xi said. With those accurate, though perhaps less-than-memorable words, China’s strongest leader since Mao Zedong caught the 700-strong audience, which included media members and dignitaries, on the hop. It was an exercise in concision from a president who, almost a year ago to the day, opened the Communist Party congress in Beijing with a granular 3-hour, 23-minute speech summarising his thoughts on a new era in socialism with Chinese characteristics. Instead, before an audience of top officials including Chinese Vice Premier Han Zheng and Hong Kong’s chief executive, Carrie Lam, Xi said his piece at the strategically located port of Zhuhai and left the podium as electronic fireworks flailed about on a television in the background. Reporters on the ground, including Bloomberg’s Fion Li, were quick to express their surprise and disappointment. As president, general secretary of the Central Committee of China’s Communist Party, and chairman of the Central Military Commission, Xi has quickly and effectively concentrated influence into his sphere. And Tuesday’s event seemed tailor-made for a long-winded reflection on China’s increasingly successful exercise of soft power, its sheer engineering audacity, and the political genius of building a 55-kilometer crossing that continues to grow the mainland’s security apparatus and authority on both the semiautonomous gambling enclave of Macau and the city-state financial powerhouse of Hong Kong. The bridge is part of China’s ambitious “Greater Bay Area Master Plan” to integrate Hong Kong, Macau, and the manufacturing powerhouse Guangdong province’s nine biggest cities to create a combined $US1.5 trillion tech and science hub intended to rival even Silicon Valley. The air is very thick too, with southern Chinese humidity and the ever-present eerie grey-brown pollution that wafts in blooms from heavy manufacturing out of the Pearl River Delta – the factory floor of the world – ensuring the megabridge in all its glory will be largely obscured from view year-round. Commentators have been quick to describe the project as a white elephant, noting that the lightly travelled crossing can hardly be a push for convenience but rather another covert expansion by Beijing as it extends its reach back into the supposedly autonomous enclaves of Hong Kong and Macau. The Hong Kong-Zhuhai-Macau bridge is the second major infrastructure project binding Hong Kong to the mainland opened in just a few weeks, following a new high-speed rail connection that opened in September – the first time Chinese security were stationed on and bestowed authority in Hong Kong territory. Certainly, there is anxiety in Hong Kong, with critics fearing the increasing inroads into the special administrative region’s territory by an ever-assertive mainland, while some local media has suggested that drivers on the bridge will be closely scrutinised by cameras that examine even their physical condition and how fatigued a driver is becoming. The issues of territoriality may dominate the project for years to come; most of the bridge is considered mainland territory and Hong Kong vehicles and drivers, already hit by restricted access, will be travelling under the laws of the mainland, Hong Kong’s transportation department has warned. “The Hong Kong government is always out of the picture and is under the control of the Chinese government,” the Hongkonger lawmaker Tanya Chan told AFP last week. Construction of the bridge began in 2009 and was targeted for completion two years ago. It’s also a gorgeous trip by ferry.